These two words are very similar. It's easy to assume they mean the same thing. One is just spelled slightly different. The term Ethernet refers to the data flowing from the modem to the router. This data flows through what is called an Ethernet cable and is connected to an Ethernet connector. The term Ethernet is often explained as your LAN or Local Area Network but this is not quite right. Even though most people run their LAN on an Ethernet system it doesn't mean all Ethernet systems are a LAN. I used to get these two terms confused. I kind of thought the tech savvy people were just trying to make me feel dumb by switching the terms on me every once and a while to see what I would do. I would grin and nod... not having any idea now what they were talking about. A router does exactly what it's name denotes. It routes the Internet to all the different devices you have on your network. A router cannot access the Internet by itself unless it is a combined router/modem unit. A router needs a modem to access the Internet. The next indicator is the Internet indicator. It will also go from solid amber to solid white when it is ready to use. If it is off that means the router doesn't have the Ethernet cable connected to the modem. Now that you should have a good idea of what the indicators on the front look like, let's take a look at the back panel. In this first image I have circled the antennas. 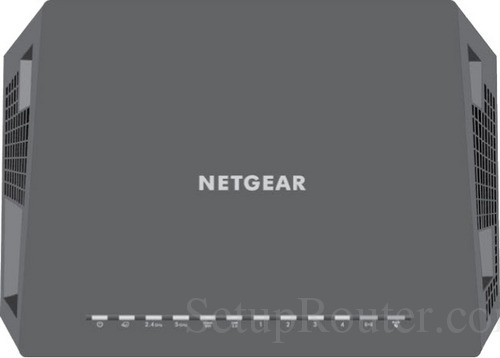 The router you are setting up probably doesn't have three but an antenna connection will look like the ones I have circled above. DON'T position the router near any other major electrical appliances like microwaves or home security systems. The bandwidths are very similar and can cause you to lose connectivity to your Internet if you place the router close to these type of appliances. Take the Ethernet Cable that came with your router and attach it to the WAN port of your router. The other end of this Ethernet cable needs to be attached to the modem. Ethernet cables come in all different colors. So don't panic if your Ethernet cable looks different than the one above. Just make sure it is connected to the WAN port on your router. The WAN port will almost always be separated from the LAN ports. After you have successfully logged into your router's web interface make sure to change the default passwords. Both the router login password and the WiFi password. Here on this site we have all the guides you need to make your local network as secure as possible. Make sure to check them all out.